[MMIT New Moon Manifesting Call - Transcend Duality! And some new juju! info in the P.S. 's at the end of this email! Some new fun juju & stuff! Virgo's mutable energy will support you in re-calibrating your inner core. Enter the Cave of Manifesting and Healing where we will connect you to to your core.You will leave this call feeling energized, deeply connected to your heart and ready to manifest your hearts desires! re-balance and transcend duality. The magic of the faeries will support your as we enter an new realm through the Cave of Manifesting and Healing to lay upon the crystal grid and receive the deep healing your soul has been searching for. Allow the energy of Earth ~ Virgo to support and transform you in manifesting your true hearts desires. Engaging with the energy of Cardinal Water! P.S. I have updated the New Moon Checks for you! I have added the "Paid in Full" for you to save time each month. Anne created a special image for us to color along with her and myself! I am so excited to be a bigger part of your manifesting! Just posted a diary on San Francisco's new Community Choice Aggregation energy program, CleanPowerSF. Recs appreciated if so inclined. join me virtually this Friday Night for a Full Moon Lunar Eclipse Release Ritual. I have invited a couple of close friends to come over for this Fire Release Ceremony. Are you ready to rise like a Phoenix??? 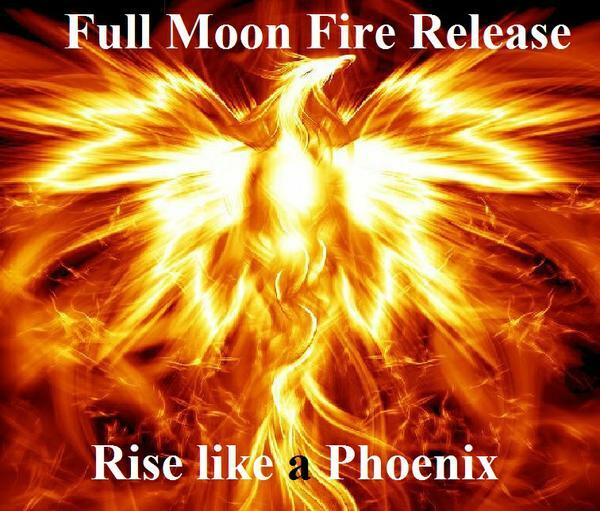 Join me energetically this Friday night in a powerful fire release ceremony. No cost to you unless you choose to send a donation. We have a delightful fire pit on our back yard and will creating some offering bundles from some of the flowers and shrubs in our yard to represent what is to be released. I will be calling in the elements, elemental's and directions for support and I invite you to send me an email simply stating "Add me to the list". I will add your name to the list to be a part of the collective. Please follow the instructions below to participate. You do not need to be present, this will not involve a phone call or recording. Simply tune in at 8:00 pm Pacific time as we will have the sacred space created and ready for the release. 1. Write out a list of the story you wish to release. DO NOT email me the list or the story. "Add me to the list"
3. If you choose to sit in meditation at 8:00 Pacific time and tune in - great, but not necessary. You will receive your release just by the action step of writing your list or story and sending an email. 4. Emails must arrive by NOON Pacific on Friday August 19th to be included in the ritual. Think about all the energies you may have buried deep within. Lack, Limitation, Resistance, Anger, Resentment, etc. What are you ready to let go of so that you can Rise like the Phoenix? Write it out... Send my staff an email as noted above and you will be added to the list for the power releasing ritual this Friday night! See you in the Ethers! To keep this simple, please follow the instructions shared above to be sure you are included in this offering. It would be great if this could make it to the rec list! or depression? Or, maybe you just know there is more joy to experience than you've felt! If you could just move through the anxiety or uncertainty, everything would be so much easier. These emotions seem to be a common part of our world, but I promise you that these feelings do not need to be an everyday part of your life! What?! How can a person possibly make such a promise? I can because I've experienced it! Join me, our host Melanie Newman and many other experts who have also learned and experienced how to rise above life's challenges and live a life filled with joy! There is a light within each one of us that when allowed to shine directs our life to one of fulfillment, growth, prosperity and joy! Learn the secrets how to not only overcome the challenges but to thrive and live a joyful and fulfilling life! Register for this free online summit where our host, Melanie Newman will guide you through the experiences and knowledge of over 20 experts in the fields of self-growth, prosperity, relationships, business, and more. Receive not only knowledge but practical tools you can use immediately to help you on your path to joy. Along with all the knowledge and tools, you will also receive a free gift from each expert just for listening. own home.Or take it on the go if you prefer. to walk the pathway to your joyous light! and live a life of joy are just a click away! extra JOY in their life? I decided to take a little trumpout for the day and write about something that inspires me: protected bike lanes. [MMIT Is it time for you to create your future now? Join me tomorrow on Season 10 of Awaken To Happiness Now with my good friend Shefali Burns! Shefali is truly authentic and caring. She holds a warm, accepting and unconditional space for her guests and her community. The theme for this season is "Build on the Momentum of the Universal Energies and Create Your Future Now!". Are you ready to build momentum and create your future now? Do you wish you could move past your issues, blocks, and limitations that have been holding you back? Experience the powerful energy processes, activations, healing techniques, and tools & strategies that will help you to create your future now and shift your life and shift your life and consciousness forever! When you register, you will receive access to all of the calls and the Happiness Kit to start you on your journey to a more fulfilled and happy life and it's yours absolutely FREE.Register and get FREE Access to this amazing network of transformational leaders, teachers and thought provokers along with all of the wonderful BONUS gifts. P.S. Register now to receive call details and the Happiness Kit! [MMIT New Moon Abundance Check reminder - Magic & Wormholes Oh MY! Reclaim pieces and parts of your inner core that have been left through out time and space during your souls journey! Integrate it with the warmth and radiance of the sun's energy. Journey to a special Meadow and down the trunk of an old oak tree into a labyrinth to a magical creation space. Then through a portal to the Great Central Suns. we anchor it into your Mid Brain to truly attract your desires! Pure Magic! me on my magical journey! (Best time to write checks - Tuesday after 1:44 pm PDT until Wednesday Aug 3rd at 9:13 pm. Then wait until Aug 4th 12:34 am PDT to start writing checks again! moves into Virgo on Thursday Aug 4th at 12:34 am PDT. moves void of course again.